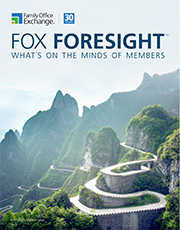 FOX Foresight keeps members up to date on the latest thinking on matters that affect enterprise families. It summarizes what we have been learning from our members and our subject matter experts over the last year. Please share it broadly within your family, your office, and your advisors.